This Nike Pro Combat Hyperstrong Knee Sleeve, like most knee sleeves, are intended for such physical activities as running, weightlifting, basketball and similar activities with purpose to avoid different knee joint, ligaments and muscles injuries, for example, patella dislocation, ligaments injuries, pulls or fatigue of muscles. As these activities are connected with constant load on knees, these knee injuries are quite widespread, therefore, you can try to use knee sleeves like Nike Pro Combat Hyperstrong Knee Sleeve to prevent them. This Nike product is considered as movement support, so we can conclude, that its function is not only protection, but supporting as well. Despite the lightness of this knee sleeve, it is still providing an excellent support – lightness of this sleeve is provided by lightweight Ariaprene material which supports knee joints and keeps muscles warm. It should be mentioned, that this material has abrasion resistance and thus longevity, so it keeps its functions for a longer period of time. 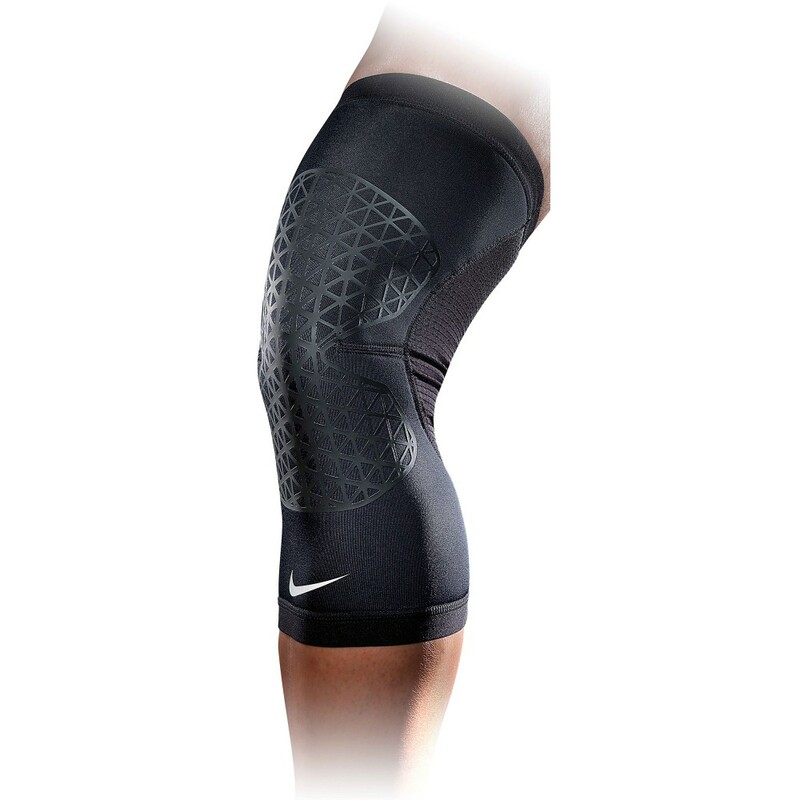 Another feature of this Nike knee sleeve is mesh vents which are strategically placed on fabric, ensuring breathability and expelling excess heat, therefore, athletes stay cool and dry, despite the intensity of activities. This knee sleeve has contoured design which ensures freedom of movement and thus comfort and performance. This product features elastic binding which is combined with silicone grip, therefore, it stays firmly in the place, ensuring permanent comfort. This Nike Pro Combat Hyperstrong Knee Sleeve covers half of the tight and half of the shank, providing superior coverage for protection and support. It comes only in black color, but it has gray and stylish design on the area of knee which gives it modern look. This knee sleeve has white Swoosh logo on bottom, demonstrating originality of this product. This Nike basketball knee sleeve has four different sizes – S, M, L and XL. To find out which is your size, you have to measure your knee circumference. When you have find out your knee dimensions, follow the further table. Nike Pro Combat Hyperstrong Knee Sleeve is intended for knee protection and support during different physical activities, for example, running, weightlifting, basketball and similar activities to prevent different knee injuries, for example, patella movement, ligaments injuries, pulls or fatigue of muscles. This product is made of nylon, thermoplastic elastomer, polyester, spandex and silicone. As this knee sleeve is available in four different sizes – S, M, L, XL – it is suitable both for adults and youngsters, unless their knee dimensions are appropriate to given sizes. This Nike Pro Combat Hyperstrong Knee Sleeve comes in black color and it has features such as lightness, Ariaprene material, abrasion resistance, mesh vents, contoured design and elastic binding with silicone grip. This product is machine washable and usually it is sold as single, therefore, if you need protection and support for both of your knees, you have to buy two exemplars.